The origin of Ultra-High Energy Cosmic Rays (UHECRs) remains a great mystery. The extremely energetic sources that produce them are still unidentified. Recent data have confirmed their extragalactic nature but have questioned their composition and increased the mystery behind it. To identify the first source a significant increase in the observed cosmic rays of extreme energies (around 1020 eV) is needed. JEM-EUSO is designed to increase the number of observed Extreme Energy Cosmic Rays (EECRs) by an order of magnitude during its mission. Ground observatories (HIRES, Pierre Auger, and Telescope Array) showed that the cosmic ray energy spectrum exhibits a slope change just before 1020 eV that may be due to the interactions of cosmic rays with the cosmic background radiation relic from the early Universe. The spectral change is called the GZK effect after Greisen, Zatsepin, and Kuzmin (1966) who predicted the change in spectrum due to photo-pion production for protons and photo-dissociation for heavier comic ray nuclei. However the change in spectrum may be due to the intrinsic limit of astrophysical accelerators. A clear source in the sky will resolve this conundrum and begin to unveil the mystery. The observed sky distribution of arrival directions shows hints of anisotropies that can become sharp with a significant increase of observed EHECRs events. Once sources are identified, important astrophysical processes will be revealed as well as the ability to study particle physics interactions with center of mass energy above 100 TeV, an order of magnitude above terrestrial laboratory energies. 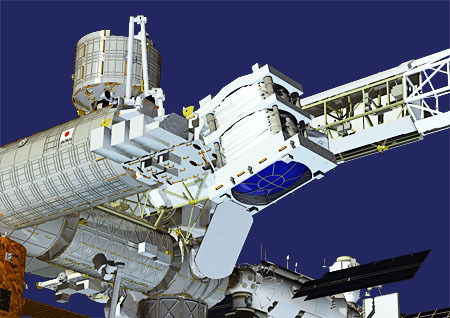 The JEM-EUSO experiment, Extreme Universe Space Observatory at the Japanese Module of the International Space Station, is the first space mission devoted to the scientific research of cosmic rays of the highest energies. The super-wide field of view telescope looks down from the International Space Station onto the night sky to detect UV photons emitted from air showers generated by UHECRs in the atmosphere. It will collect the highest rate of extreme energy cosmic rays and look for showers produced by neutrinos and photons. 13 Countries, 77 Institutes and about 280 researchers are collaborating in JEM-EUSO, with the support of the most important International and National Space Agencies and research funding institutions. NASA began supporting the mission in 2013.